Fire protection of CNC and other machine tools is critically important as there is a great risk of fire in these valuable machines. Fires can quickly cause expensive down time, costly repairs, possible human injury, and damage to plant and equipment. 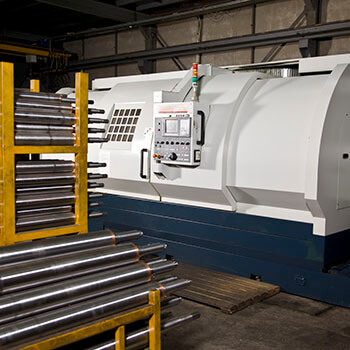 The number of CNC machines throughout the world has grown dramatically as they have become established as state-of-the-art equipment for milling, drilling, grinding, tapping, honing, turning, and other operations critical to manufacturing. These machines can cost up to $200,000 each, and are designed to run 24/7 in a demanding, often grueling work environment. Fires in CNC machines are commonplace. Using oil-based coolants, typically combustible petroleum or mineral oil, flash fires are reported as a “fireball” when oil mist is ignited. Without an immediate and automatic fire suppression solution in these “micro-environments”, these fires can be catastrophic to the operator and result in significant downtime and expensive property damage. While sprinklers are often required by insurance, they will only control the spread of a fire throughout a plant. Stat-X® offers a compact, economical, and reliable solution to protecting the CNC machine and operator from extensive and costly damage and injury. 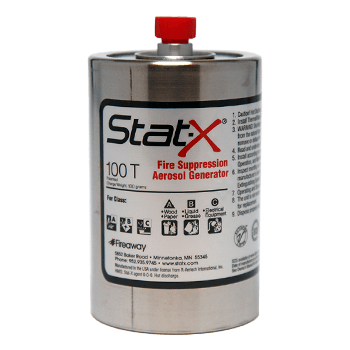 Stat-X condensed aerosol fire suppression technology offers the CNC machine owner a compact and economical fire extinguishing solution. A Stat-X unit consists of an extremely rugged, sealed, stainless steel canister containing a stable, solid compound. The canister is durable and non-pressurized, and is designed to withstand the harshest environments. In the event of a fire, Stat-X units automatically release ultra-fine particles and propellant inert gases which quickly and effectively extinguish fires without depleting oxygen levels and with no negative impact on the environment. The Stat-X unit is designed to extinguish the fire in seconds, often even before an operator has time to react, and to put out the fire, enabling production to resume within an hour. Hundreds of CNC machines throughout the world are being protected by Stat-X units. It’s time you considered these for your machines! Stat-X® extinguishing units are compact and modular. Stat-X units are available either as electrically activated units, integrated with a variety of fire detection systems, or as manually-activated units, with a cable-pull action. They are available in several sizes, adaptable to a great variation of applications. Typical CNC and machine tool installations include a single Stat-X aerosol generator installed with a linear heat fire detection system, an interface with the machine’s emergency shutdown system, and a release control panel. The simplicity of this system results in an extremely robust and versatile fire suppression system for the machine shop owner. Retrofitting into CNC machines is fast and easy, and requires minimum installation time. Installation of Stat-X units requires minimal expense as it is typically bolt-on. The simple and robust design requires virtually no maintenance, thereby reducing ongoing operating costs. Discharge of the extinguishing agent causes no harmful byproducts, so in the event of a fire, downtime is kept to a minimum. Stat-X fire suppression systems are being used by hundreds of tools used by machine and tool and die shops throughout the world. This is a proven solution that can save you downtime, costly repairs, and greatly reduce the risk of human injury.